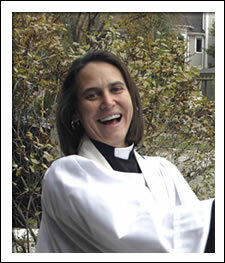 Whispers in the Loggia: Jesuit Alum, Lesbian Bishop? So some of our Episcopalian friends are all up in arms screaming about the coming of the Apocalypse. Again. Three years after the sky didn't fall in when Gene Robinson was elected bishop of New Hampshire, American Anglican are prepping to do battle over the likely election of an openly gay woman, Bonnie Perry, as bishop of California -- the diocese has its seat in San Francisco. An alumna of the College of the Holy Cross in Worcester, Mass., where she earned a BS in Biology, Perry is currently rector of a parish in Chicago and has been in a long-term relationship with another clergywoman. Another of the five shortlisted candidates, Rev Robert Taylor, the Dean of Seattle, is also in a long-term gay relationship. When the Episcopal church first appointed a gay bishop, Gene Robinson, in 2003, it triggered a crisis in the Anglican faith, which claims 77 million followers around the world. The Windsor Report, a study of the controversy adopted by the Anglican prelates the following year, recommended a moratorium on appointment of gay bishops and suspension of gay marriages. If California's Episcopalians elected a gay or lesbian bishop and the choice was ratified by the national church's general convention in June, some observers believe it would lead to an irrevocable split. The Archbishop of Canterbury, Rowan Williams, has expressed deep unease over the nominations, which were announced last month. "If there is ever to be a change on the discipline and teaching of the Anglican Communion [on homosexuality] it should not be the decision of one [national] Church alone," the archbishop told the Church of England Newspaper. "The Church must have the highest degree of consensus for such a radical change." The California election could also further fragment the Episcopal church, which has suffered defections from conservative congregations since the appointment of Bishop Robinson. Cynthia Brust, speaking for the American Anglican Council, a conservative pressure group within the Episcopal church, described the nomination of Revs Perry and Taylor as "an open act of defiance." "My hope is to continue creating a community where people come to ask the deep questions of life." Questions like: How can I make a difference in the world? What happens when I die? Must I embrace a particular dogma or doctrine to be a spiritual person? I don't believe that any one individual can answer these questions. However, I do think a worshipping community made up of other people who are also wrestling with these important issues can offer perspectives that will help each of us along our own life journey. I also believe that each of us has been given a unique gift by God that we may choose to use to better our world. A core belief at All Saints' is that the Gospel doesn't matter a rat's tail if it doesn't change people's lives. So we invite people to discern what their gifts may be and then find many and varied ways to make use of these gifts to begin changing our world. You'll have to forgive me -- it's just nice to hear some churchperson who's remembered that the Gospel's message is more than repression and judgment.